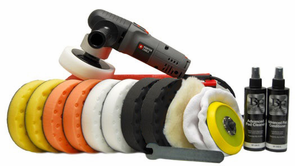 The Porter Cable 7424XP – XL Pad Kit is a great value for a huge selection of foam pads. Perform defect removal, polishing, and wax application with this kit. Pinnacle pad care products are included. For a Limited Time receive a BLACKFIRE Polish 2 oz. sample, a BLACKFIRE Compound 2 oz. 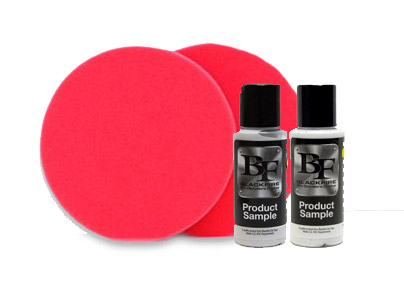 sample, and 2 5.5" Red Soft Wax Pads FREE with your purchase of this kit! Retail Value $17.96. The Porter Cable 7424XP – XL Pad Kit is loaded with premium Lake Country foam pads. This kit gives you multiple options for paint correction and polishing, plus Pinnacle pad care products to maintain your pads. The Porter Cable 7424XP – XL Pad Kit is an excellent foundation on which to build your detailing arsenal. The white heavy polishing pads feature high absorption foam for the application of waxes, micro-fine polishes and sealants. This pad has lighter cutting power so it’s perfect for pre-wax cleaners. A total retail value of $300.97, you save $20.98 off the regular retail price!